Remote PC Support and Data Backup – Remote PC Access and Computer Services. In today’s marketplace, you can’t afford to be limited by your physical location. Fortunately, there are many services to access your data remotely. But many conventional remote solutions require complex onsite installations which may delay access to your data or create security risks. With IsUtility®, there’s no need for complex onsite installations. You simply log-in and access your entire network – data, files and applications - from anywhere in the world, while keeping your data safely protected in our secure SAS-70 Type II datacenter, which is sheltered from physical intrusion and monitored 24/7 by our certified team of security experts. With a simple web browser and Internet connection, our remote pc access services allow your employees to log in and access their data, email and applications from anywhere in the world - whether they work at headquarters, a satellite office or on the road. It doesn't matter where or how you access the network, the experience is exactly the same with IsUtility® remote pc support. Users throughout the company network can access their data and applications from anywhere in the world using our remote pc support services. Your data and applications run centrally from our secure SAS-70 Type II datacenter and function so seamlessly it's as though they were running locally. There is no need to purchase additional equipment for remote locations or hire experienced computer network consultants staff to provide onsite user support. Since all computing is done centrally, office communication is seamless and collaboration of all company data is assured. 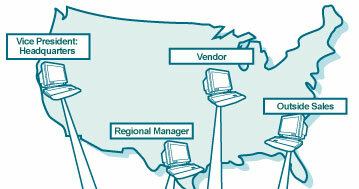 IsUtility®’s centralized system allows you to set up satellite locations or integrate multiple locations instantly. There is no need to invest in extra equipment or onsite IT staff to provide user support. Since you pay only for the resources you use, you can add new users or office locations any time - without any capital IT investments. 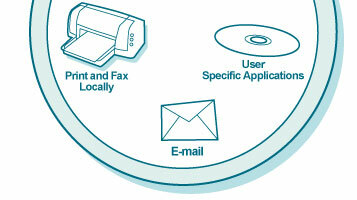 Weve resolved many of the printing issues most IT vendors struggle with. Using our remote pc access services, remote users can print locally, instantly receive and send e-mail, faxes and voicemail messages.